Witness a love story that must come out at an advance screening of Love, Simon! Click here for your chance to download an admit-two pass to see the film on Wednesday, March 14 at 7PM in SLC! Seating in the theater is first-come, first-serve and is not guaranteed. Please arrive extra early for ticket exchange. We’ll see you there! Synopsis: Everyone deserves a great love story. But for seventeen-year old Simon Spier it’s a little more complicated: he has yet to tell his family or friends he’s gay and he doesn’t actually know the identity of the anonymous classmate he has fallen for online. Resolving both issues proves hilarious, terrifying and life-changing. 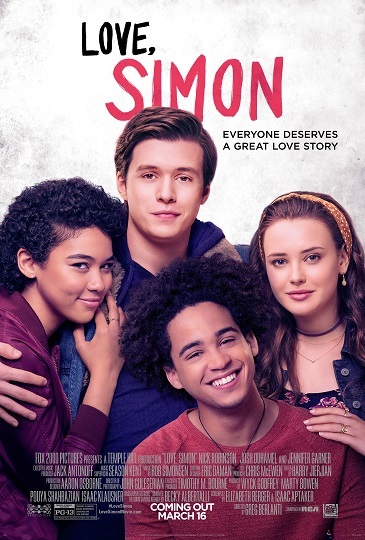 Directed by Greg Berlanti (Dawson’s Creek, Brothers & Sisters), written by Isaac Aptaker & Elizabeth Berger (This is Us), and based on Becky Albertalli’s acclaimed novel, Love, Simon is a funny and heartfelt coming-of-age story about the thrilling ride of finding yourself and falling in love. Love, Simon comes out March 16.